If you've ever encountered a child who doesn't want to read a book, then this might be the book for you. The Covers of My Book Are Too Far Apart (And Other Grumbles) starts with the words 'Huh! Reading's rubbish!' and is soon followed by all kinds of reasons and places people read, and what they like to read or do while they are reading, in answer to some of the reasons people say they don't like to read. It covers just about all the excuses you can imagine, like: it's hard, it's boring, the books are too big, or for little kids, or for school, and many more. So what about those people who enjoy reading? There are pilots who want to feel they are part of the story, superheroes who read comics, people who read about their favourite sports and hobbies and others who like to find out how to do stuff. They have favourite books at home, read books in many formats, and books that match their interests. They read to stop boredom, and to help relax before bed, or instead of tidying their room! There are so many people pictured in The Covers of My Book Are Too Far Apart (And Other Grumbles) that readers are sure to find someone that reminds them of themselves or someone they know. 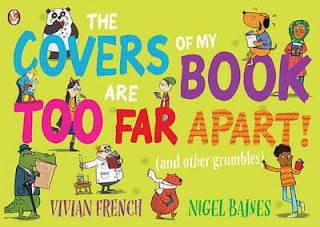 The Covers of My Book Are Too Far Apart (And Other Grumbles) is a new title from Picture Squirrels, designed to be dyslexia-friendly, and encourage less confident readers. It's subject is one that is important, and the way it's explored is fun and not didactic, with bright energetic illustrations.